For the Answers to the Packet Lessons 13, 14, 16, 17, 18, 19, and 20 click the HOMEWORK link above. What is a Solar System? The star at the center of our Solar System has a name, and no it's not the "Sun." It's name is actually "Sol." Everything in our Solar System revolves (travels around) Sol, so we call Sol and everything that goes around it the Solar System. You’re one minute away from knowing an essential skill to finding your way around the sky. • Astronomers measure the apparent distance between objects in in the sky in a unit called "degrees." There are 360 degrees in a circle. And the apparent distance (or "angular separation") of any point on the horizon and the point directly overhead (the zenith) is 90 degrees. Halfway from the zenith to the horizon is 45 degrees. So far, so good. - The width of your little finger at arms length is 1 degree. 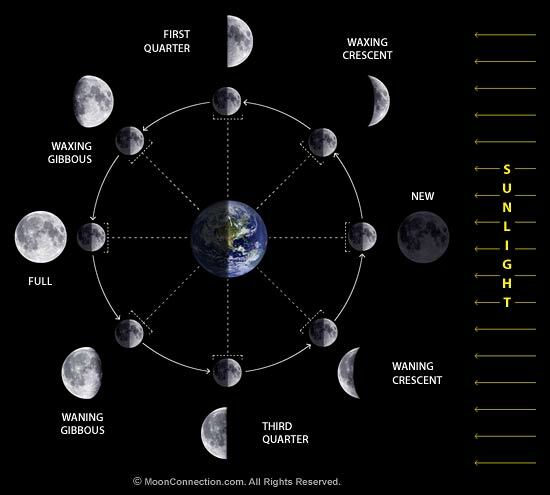 Great Youtube video from NASA showing the phases of the Moon, click here.